There have been very few instances in my life where someone has shown me a book, I’ve read it, and it significantly changed my life for good or ill. 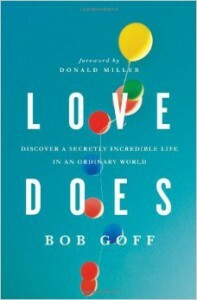 So when, for nearly a year, my Twitter feed and Facebook timeline routinely had quotes from and reviews of Bob Goff’s book Love Does: Discover a Secretly Incredible Life in an Ordinary World, I had cautioned optimism that perhaps there might be something I was missing out on by not yet having read it myself. So, after finishing a fiction book this summer, I decided to finally give the book a try. My cautiousness was warranted. Love Does is somewhere between an autobiography and a collection of parables aimed at discovering a hidden world filled with possibility and wonder within the everyday life we live in. As one might ascertain from the title, it’s primary goal is to push across the idea that Christian love is a love that is meant to be vibrant and alive with wide-eyed amazement, active and engaged with all those around us and with the God who created each of us. Through accounts of various happenings in Mr. Goff’s life, he tries to show that an active love is what we are called to as followers of Jesus and that living with a sense of whimsy towards loving others can lead us into an incredible life. This summary is the best light I can put on the book as a whole and I genuinely believe that it was Mr. Goff’s intention that this book would convey the above in a meaningful way. Unfortunately, it fails to deliver this promise both in whole and in part and I am actually disappointed that it did. The problem I found with Love Does is twofold. First, the character in most of Mr. Goff’s stories, Bob, or himself, comes off as a bit of a jerk. And second, it does not simply capture a life lived in serving others, it also encapsulates Mr. Goff’s personal theology which, as presented, has some fundamental shortcomings. Let me address the first issue, that of the character Bob. I distinguish between Bob, the character and Mr. Goff, the author and lawyer because I have respect for the man who wrote about his life in a candid way and genuinely wanted to get a solid message out to the world, something he has done in some small part. The character in the book, however, is not the best guy in the world. Each chapter of Love Does is a small anecdote, something like everyone has come to expect in every sermon in America and through most of these, Mr. Goff tries to draw out a truth about the way we live or about the nature of God. Bob, though, divorced from the segues into how his antics might teach us about the nature of “missing the mark”, for example, comes across as a narcissist and a jerk to his friends. There are many stories where Bob does something to someone else that most folks, I would think, would find either mean, misguided, or sometimes downright reckless. One of the first stories is how Bob likes to play pranks on his buddy. This friend got married and since Bob and his wife knew where the prepaid honeymoon suite was, they passed themselves off as the happy couple and checked in early, ran up a $400 room service bill and bailed, sticking his friend with the tab on the first night of wedded bliss. Then, through a series of incredible events (as most of Mr. Goff’s stories contain) because he thought his friend as pranking him back, he ended up agreeing to be the Ugandan consul in America. The point, as told, was that God opens doors for us if we say “yes” more. Regardless of Bob’s or his friend’s income level, the chapter left a bad taste in my mouth, a smell of a pattern. He later on tells how he stalked his wife to get her to date him, badgered a dean for weeks on end to get accepted into law school, and let his 10 year old son ride a motorcycle through the desert resulting in a spectacular crash that he later recalls as “awesome” amongst other stories. In the first half of Love Does, Mr. Goff tries to show how leading a life of whimsy and carefree love while trusting in God will result in the participant being blessed with “something more” in his life. However, he does this by showing Bob doing some pretty stupid things, some pretty selfish things, until he gets what he wants, then tells us that clearly God wanted that for him all along. In doing so, Mr. Goff presents us with the first taste of his theology: a modified version of the prosperity gospel, one with a distinctly restorationist twist. The version we are presented is not “do good deeds and get good things from heaven” as is pushed by Joel Osteen and Rick Warren, but instead “if you follow God and Jesus, your life will become something more.” This twist is subtle, and taken out of context from the stories of Bob, one could definitely argue that this is true. However, the vague nature of this message “something more” could mean anything from riches to spiritual uplift and the only clues we are given in the book are of Bob’s material and emotional successes. Thus, while probably not Mr. Goff’s intention, Love Does implicitly tells us that if we follow God and love others, then earthly blessings will come our way. The second half of the book segues from this message into Mr. Goff’s personal theological beliefs, and it is here that Love Does seriously falters. Throughout the book, Mr. Goff continually calls out “religious people.” At first it is just a brief mention here and there, usually saying that such folks are misguided and only need to let go a little, but by the middle of the book, he doubles down and specifically says that such people are fake Christians and should be avoided. Not only the people, but also their practices, their “$20 words,” and their “doctrines and statements of faith” among other things are poison to the real Christian, who lives a life of whimsy and risk-taking love. It is a pity that Mr. Goff never actually defines his terms. The reader is left to work out for himself what “religious people” are. Is it people who use the Bible as a legal document only? Is it people who think works-only salvation is a thing? Is it people who love God and go to church? Is it people who follow disciplines to strengthen their resistance to the sin in their life through God’s grace? We are never told and there is no distinction made. However, one major point Mr. Goff gets across loud and clear is his skepticism and explicit rejection of intellectualism in Christianity, a strikingly odd position coming from a lawyer by trade. He makes certain that we understand that we see God as a person and we can’t find him just by reading books, and amen to that, but he throws all of that away for just experiencing God. Mr. Goff has subscribed to the “Jesus and me” version of Christianity where all other accounts of encounters with the divine outside of the Bible and his own experience are suspect, that the accounts of such encounters are rubbish, and all intellectual discourse on such matters is useless. Perhaps no story better sums up Mr. Goff’s theology better than his story of being in a sailing race. In this race, they needed a manual navigator to get them across the Pacific Ocean to Hawaii. Their Navy friend, who had many charts and almanacs and a fancy sextant, was called up to duty at the last minute taking his tools and books with him and Bob was selected to take his place. For reasons not fully explained, Bob chooses to purchase a cheap sextant from a sports store and a large but non-detailed map. The explanation from the shop assistant on how to properly use the sextant being too much, Bob asks for a short cut, something simple. He is told there is a way to use the noonday sun’s position only, but the trade off is a 60 mile margin of error. 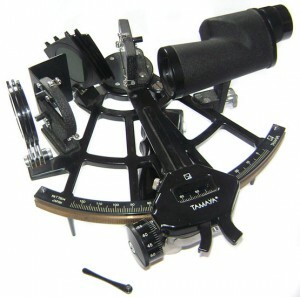 Bob says this is good enough and with this knowledge and his inexpensive sextant, the team finishes the race, their names announced as they enter the final bay safely. Mr. Goff says that this is the true way to get to God. As he got to the finish without all those fancy books, so we too can get to know God without knowing all the finicky rules and doctrines that weigh down Christianity. The end. Mr. Goff’s analogy works, but only in one instance, initial discovery. It is true, one does not need to know anything about God at all to find him. One can have only cursory knowledge of God and Christ to encounter the divine and to be fully wrapped up in holiness. However, Mr. Goff leaves it at that. He finishes his analogy by linking finishing that race with getting to heaven, that the whole of the race was like living the Christian life. It is here that he is mistaken. There is a reason the Navy man had all those charts and precise instruments, it is because sailing was his life, it was not a one time encounter with adventure. If Bob was to make sailing his life as well, he would, I hope, rightly seek out better equipment, read books on sailing and navigation, learn the ins and outs of the business of moving a boat to and fro over the sea, all that technical stuff. But he would also seek out other sailors, learn from experience, read stories of Sinbad and of naval battles, he would learn a fondness of the sea beyond the initial wonderment of it all. Mr. Goff’s “good enough” strategy works for the sheer awe of first finding God, it works even for the first awe of finding true love, but it fails at finding anything deeper besides one’s own preconceptions and passions. Left with “good enough” we might see mirages and mistake them for land, might not be able to navigate at night or in a storm when the sun is all but blotted out, might get shipwrecked on a foreign island with no way home, we might die. If we truly love God, then “good enough” isn’t. We take Him all, with all the finicky bits and paradoxes that come with an experience with a Person beyond comprehension. And to describe such a thing, it is necessary to use those books and doctrines and $20 words. To sail well the rest of your life takes practice and determination. Whimsy and dreams can get you in the water, for sure, but they can’t find you a distant land on their own. There are other issues with Love Does: literally incredible stories, most clearly embellished, a poor understanding of scripture and of the purpose of Christ’s gift of the Church to humanity, an understanding of sin that is essentially Universalist, and on and on. In truth, it is simply a pop-theology book that offers little in the way of what its title promised. There are some bright spots, especially at the end, when, in the last few chapters, Mr. Goff talks about his work in Uganda setting up schools and working to free many incarcerated children and teens through the broken legal system. The book would have been infinitely more enjoyable if this story was the only one told throughout the book. It is only at the end that Love actually does Do without any kind of individual emotional or material gain, only there does the book live up to its title and not to a series of quaint notions about God and the judging of other Christians over the authenticity of their faith. Love does indeed do, but unfortunately, this book does not. This entry was posted on July 1, 2014, 10:12 am and is filed under Christians, Churches/Organized Religion, Law, Nature of God, Religion, Sin and Salvation, The Bible. You can follow any responses to this entry through RSS 2.0. You can leave a response, or trackback from your own site. Hey brotha!His book changed my perspective big time. We need a lot more Bob Goffs in this world. I pray your walking out your faith boldly too.